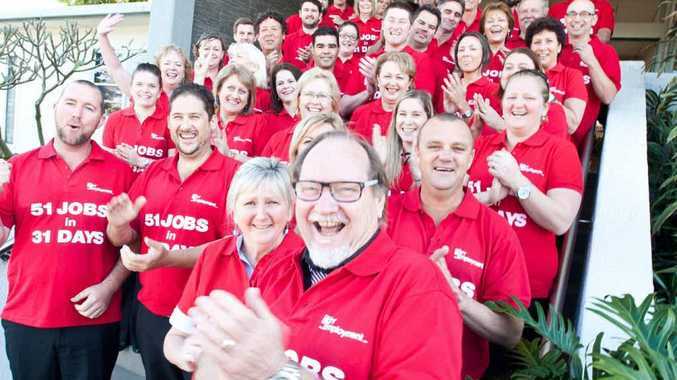 SEEING RED: Key Employment staff are wearing their intentions on their sleeves as part of a major jobs drive in July. KEY Employment is aiming high for July with the whole team committed to finding jobs for 51 people in 31 days throughout the Coffs Coast and beyond. boost the prospects of dozens of locals. Key Employment manager of employment and placements Steve Keenes said employment not only provided a wage to pay the bills, but also improved all aspects of a person's life. "It gives people social wellbeing and motivation as well as money to enjoy life," Mr Keenes said. "Finding 51 jobs across all our sites is an achievable target but with the economy the way it is, people might be hesitant to spend money." To combat this, Key Employment is offering a bit of extra help for anyone who takes on staff in July. "We're offering quite significant wage subsidies to employers which helps with the initial costs of taking someone on," he said. "We also help with on-the-job support." Key Employment staff are decked out in shirts to help spread the word to as many people as possible and every success story will leave a ringing in their ears. "We have a jobs bell in our office and every time we place someone we ring it - it really keeps the motivation up," Mr Keenes said. "A couple of years ago we did a similar campaign aiming to find 100 jobs in 100 days and we smashed that."